Residents on the Lansbury Estate tell me that on the 5th July, on the Monday evening, the members of the newly elected Lansbury West Estate Board were kicked out of their own meeting by members of the Poplar Harca Resident Engagement Team. After heated discussions following what members believe is a clear abuse of their constitutional rights, Fintan Tynan – Poplar Harcas Resident Engagement Manager, broke the rules laid out in the constitution, cleared the room and called the meeting to an end. The discussions started after members were immediately asked to acknowledge a new constitution with huge changes compared to the current one, without any discussion by estate board members, and more importantly without agreement or ratification by members. Members were insulted to hear that the matter of these changes was not to be a subject for discussion and never would be, and were then threatened by Harca Officers present with the fact that non-acceptance of the dramatically changed constitution would mean that you could not be members of the Lansbury West Estate Board. Elected Members argued that they were already democratically elected by residents on the estate to represent their interests, and that each one of them had already recieved letters congratulating them by Harca on their successful election to the Lansbury West Estate Board, so how could they be sacked in their first meeting? Harca Officers then instructed them that the Estate Boards were not Independent entitites, and were part of the Poplar Harca Governance Structure, and that if they didn’t like the situation they “could always set up their own residents association” that would then be fully representing residents unlike the Harca Estate Boards. Members claim that Harca do not support “Independent” residents associations in any way, and make it difficult for members to meet by blocking use of community facilities. Members do not know of any other tenants associations that exist on Harca Estates, and all that did exist have since been disbanded and absorbed into the non-independent Harca governance structure. Leaving resident without any real independent advice on their estates. Members present felt insulted and bullied by the Harca officers. They felt that they were being told that they represent Harca first over the residents of the estate, and the ‘take it or leave it’ attitude by those senior Harca officers present was an insult to the whole estate. These events have left residents on the estate angry and determined to get involved with the process of representation on the estate. They argue that the new constitution gives too much power to Harca Officers, even stopping residents or representatives from bringing complaints to meetings. Other changes bar you from critising the actions of Harca officers, or reminding them of their duties to board members. Other changes include; Harca will now be in charge of removing people who they deem to be disruptive, and restricting committee members access to those people or members who Harca deem disruptive. Harca have since cancelled another Estate Board meeting called by members last Monday 12th July 2010 without any explanation, and have now sent an ultimatum letter. This letter explains that they have to sign a declaration that they will accept the new constitution of 2010 otherwise they are not welcome as Estate Board Members, this must be signed by today 19th July 2010. This “bullying and intimidation” is from the same Resident Engagement Team that won the Tenant Empowerment Team of the Year award at the prestigious Housing Heroes Award 2010. Fintan Tynan and the rest of the Mob. Is that a ‘Glock 9mm’ he’s holding? Urgent notice to all those concerned; you may inspect the councils Accounts, and certain related documents (comprising books, deeds, contracts, bills, vouchers and receipts) at the Town Hall Mullberry Place, 5 Clove Crescent, London E14 2BG. This is different from your normal rights and only occurs once a year during the councils audit inspection by the Audit Commission. You have a dedicated and protected right under law that states you have a minimum of 20 days to inspect all of the above documents, without any restriction. This years session I’ve just found out ends in 9 working days time on the 30 July 2010..
Dont let the councils employees bamboozle you, walk into Mulberry Place without announcement, and ask to see any reciept of council expenditure that you so please, and the council are duty bound to provide you with it, including the copy facilities. I’ve done this a few years ago with a friend on another council, and its an interesting experience watching them try to lie to you about your rights. They may just try to give you a copy of the already published accounts that are on the councils website, stand your ground and demand to see what you came for, this right is entirely different, and more indepth if you choose to excersise it. You have a different set of rights protected under different regulations, and these rights can only be excersised 20 days a year. If you know what you want to see, be specific, ask and you shall recieve. Be patient as they will tell you to come back another day, but refuse, complain, ask to see their manager, they should be giving you almost unrestricted access to all of the councils reciepts, not summarised in some file, but the actual reciepts or exact copies of. placed at this address: http://www.towerhamlets.gov.uk/idoc.ashx?docid=9fb3e66d-c2ef-49d4-a731-fe765d36b736&version=-1 buried deep, deep, deep undercover, with no link to the document from the front page of the councils website and no matter how much you search from that front page you’ll never find it. Yet using the google search tool and my own internet jedi kungfu skills, I managed to find last years, but nothing on this years. 13. 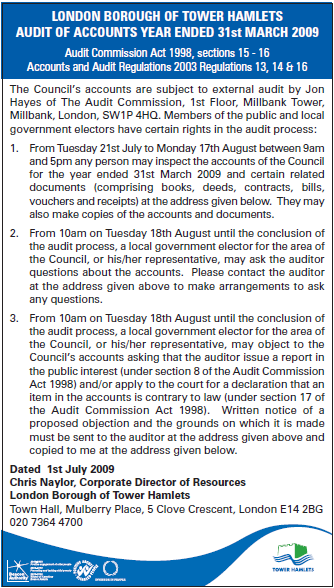 The auditor shall, for the purpose of the exercise of rights under section 15(2) and 16(1) of the 1998 Act, appoint a date on or after which those rights may be exercised, and shall notify the relevant body concerned, or in the case of a parish meeting the chairman of the meeting, of that date. 14. – (1) Subject to paragraph (2), the relevant body or, as the case may be, the chairman, notified under regulation 13, shall make the accounts and other documents mentioned in section 15 of the 1998 Act available for public inspection for 20 working days before the date appointed by the auditor under that regulation. (2) The council of a parish, or the chairman of a parish meeting of a parish not having a separate council, notified under regulation 13, shall make the accounts and other documents in relation to a period to which regulation 9(3) applies available for public inspection on reasonable notice. 15. Except with the consent of the auditor, accounts and other documents shall not be altered after the date on which they are first made available for inspection in pursuance of regulation 14. 16. – (1) Not later than 14 days before the commencement of the period during which the accounts and other documents are made available in pursuance of regulation 14, a relevant body to which regulation 11(2) applies, or in the case of a parish meeting, the chairman of the meeting, shall give notice by advertisement of the matters set out in paragraph (2). (e) the date appointed under regulation 13. (b) instead of the information referred to in paragraph 2(b) above, details of the manner in which notice should be given of an intention to inspect the accounts and other documents. accounts during the audit and local electors have the right to submit questions to the auditor. Details of these rights are published in local newspapers at appropriate stages. but as you can see, it say’s “local newspapers” when the fact is East End Lies was the only one to publish it. Why the council doesn’t put this up on their website like other councils and authorities do?, I’ll never know. So get down to the Town Hall, think of some reciepts or documents you may want to see, maybe councillors or council officers expenses submissions, properties bought or sold by the council, basically anything you can think of. (c) require copies of any such statement or report to be delivered to him on payment of a reasonable sum for each copy. (2) A document which a person is entitled to inspect under this section may be inspected by him at all reasonable times and without payment. is guilty of an offence and liable on summary conviction to a fine not exceeding level 3 on the standard scale. (4) References in this section to copies of a document include references to copies of any part of it. (b) make copies of all or any part of the accounts and those other documents. (2) At the request of a local government elector for any area to which the accounts relate, the auditor shall give the elector, or any representative of his, an opportunity to question the auditor about the accounts. (b) that payments or other benefits in respect of an office or employment under any other person are or have been made or provided to that individual by that body. (5) For the purposes of subsection (4)(b), payments made or benefits provided to an individual in respect of an office or employment include any payment made or benefit provided to him in respect of his ceasing to hold the office or employment. (2) No objection may be made under subsection (1) unless the auditor has received written notice of the proposed objection and of the grounds on which it is to be made. (3) An elector sending a notice to an auditor for the purposes of subsection (2) shall at the same time send a copy of the notice to the body whose accounts are being audited. Good Luck, have fun and be careful out there…..
Harca Door Mat Ban Update..
Andrea Baker set out details of a proposed new policy on a zero tolerance approach to any items or rubbish in communal areas, including hanging baskets and doormats. The report had been presented to JEP where it was unanimously approved. One Board member felt uncomfortable about the scope of the policy and felt that things like doormats and hanging baskets often improved the look of a block. Officers maintained that this was necessary for health and safety reasons so that escape from a property was not impeded in any way in the event of a fire. The Services Board agreed to implement this policy (with the exception of one Board member) but asked that the impact of the policy be reviewed in 6 months time and a report presented to a future Services Board meeting. Maciejewski, Ms Rumi Manik and Mr Colin Woollard. Now I looked everywhere for this type of information when i wrote the last post regarding this “Poplar Harca Ban Door Mats – 6 July 2010” a few days ago, and could not find any clarification anywhere. I wonder if anyone read this, and pumped out the summary of the Services Board meeting on the quick. Regardless, my sources were right, this is now an actual policy by Harca. The wording “communal areas” means any areas outside of your property. Zero-tolerance, is what gets me. If my sources are right, could this be what gets some people evicted from their homes? Witnesses tell me that at 4 pm Last Night 7 July 2010, that sadly a motorcyclist died in a clash with a Lorry in the Blackwall Tunnel. A London Ambulance Service Communications Spokesperson, has comfirmed to me that the motorcyclist died at the scene of the accident. Sources within Poplar Harca tell me that at a recent set of meetings with different Poplar Harca boards, it was voted to ban the use of Door Mats, Plant Pots & Hanging Baskets from outside of all Poplar Harca Tenant & Leaseholder Properties. Apparently this policy is still yet to be announced, and the majority of residents are at this moment still completly unaware. After looking at this for awhile, it seems that if true,(and I have a reliable source on this), then Harca is not the first to impose such a ban, and that their have been numerous other instances with various Housing Providers. The question now though is how will residents react to the as yet confirmed but unannounced policy (coming I assume in the following weeks) by Poplar Harca? Will tenants take matters into their own hands like those in Wolverhampton who openly flouted this restriction imposed on them by their own Wolverhampton Homes?. Will they also like the Wolverhampton residents who then pressurised their elected councillors to lobby their Council to overturn the ban?. Although at present Wolverhampton council didn’t exactly bow to the pressure but rather ordered a review of the situation, it still shows the depth of feeling amongst residents to this much heralded of traditions. I’ve been informed that this has apparently been voted through on the Harca Boards on some ‘Zero-Tolerance’ Anti-Social Behaviour Policy. It would seem this is probably going to be implemented by a warning, apparently threatening the resident with the possiblity of proceedings being carried out that could lead to you forfeiting your tenancy agreement, or your leasehold agreement, for non-compliance with this ruling/warning. Where most other associations/councils seem to have pushed these same policies through. They seem to be with regard to individual blocks of flats targeting communal corridors, and stairwells. I’m led to believe that Harca’s policy will be a blanket ban across all Harca properties, regardless of dwelling, flat, maisonnette, houses, even those items placed behind gates, well away from typically defined communal areas are to be targeted. These kind of policies at first sight would seem to have started out as what would seem to be a knee-jerk reaction to the Lanakal House Tragedy, and that some Organisations immediately brought in their own Door Mat Ban policies within a matter of weeks. If you dig a little deeper though, I believe that the Lanakal House Tragedy seems to be being used to push through policies that were already in the pipeline and were already being used in earlier cases by other housing providers. Why the need for such an extreme Health & Safety Policy though?, when you will create an uproar with tenants, and that ultimately has no link to the recent tragedy? It would seem that rather than actually thinking about Health & Safety as a first regard, it can come across as if these organisations are more worried about litigation from trip hazards occuring, and who would be responsible.Policies who’s sole benefit IMO seems in some instances to have been set up to avoid possible litigous proceedings in our modern day compensation culture. It has cited the recent fire at Lakanal House in Camberwell in July 2009, where several people died, as an example of the importance of health and safety. Although they agree that communal stairwells and corridors potentially littered with chairs, settees, bikes and the like can be a problem. They have never encountered problems with door mats, hanging baskets, or pot-plants. Resident Groups realising this is an outrageous policy are now looking to follow the example of other areas and seeking to call meetings with councillors. – Please feel free to comment on this post, and any innaccuracies you find will instantly be rectified if you notify me. After browsing the fantastic resource that is WhatDoTheyKnow.com (the Freedom Of Information (FOI) submission site that allows you to submit and share FOI requests with the public), I stumbled across a curious fact in response to a question within an FOI request to Tower Hamlets Council. So 1216 members of staff cannot afford Affordable (Part Rent/Part Buy) one bedroom flats in the borough, and will not be allowed to even view them probably, as checks on finances need to be carried out. This got me thinking, 1216 members of staff seems like a lot of people, which it is, but comparing this with my assumption that Tower Hamlets probably employs 10’s of thousands of staff, this can seem like a small figure. This set me on search for how many Council Staff are actually employed by the Council? Got me thinking about setting up an FOI request myself. The problem is though, that you dont really want to waste an FOI request on just one question, you either want to set it in the context of a set of questions, or as part of some research that would in its entirety reveal some obscure answer that you were searching for. If your lucky these responses get to reveal more answers, or as things go usually, prompt you to answer more questions. How many people does the Tower Hamlets employ? But this request like so many others is sadly missing from the published requests on the councils own FOI archives of disclosed requests. Yet on the whatdotheyknow site, the answer is published for all to see, nothing personal, nothing for the council to worry about, but they seem not to want to publish some answers. 3- How many people does the Tower Hamlets employ? Now this answer alludes to the fact that it “excludes schools”. Never mind, as the first FOI request that reveals 1216 employees do not meet the minium income requirement, also doesn’t include schools. I wonder how big the figure would be then? So 20% or 1 in 5 people working for Tower Hamlets, not including Teaching Staff, cannot afford to buy into the councils much-heralded ‘Affordable Housing Scheme’. These figures are worked out from a one bedroom flat in just one development from one Registered Housing provider. I would imagine that the figures go up exponentially with the amount of rooms you require. Seeing that its also a fact that at least 64% of local working people in the borough (as defined in the Cabinet Report from December 2009) are already priced out of the housing market, then its no wonder so many of these homes are lying void. These figures seem disturbing to me, so if my analysis is incorrect, then please feel free to contact me with some corrections that I may use to update this page. 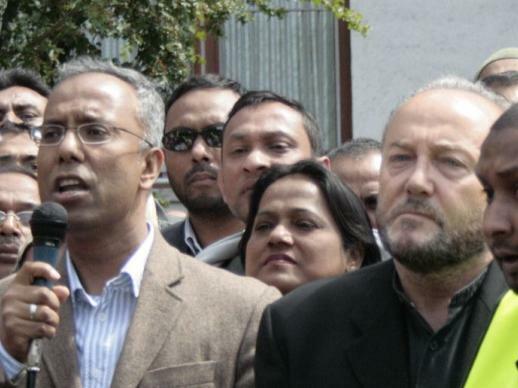 Could George Galloway and the Respect Party now be pushing for support for ousted Labour council leader Lutfur Rahman in his bid for Tower Hamlets Mayoral Seat? Even though Lutfur Rahman has been dropped as a candidate by his own party, there are rumblings that there may be other routesavailable for him, to this coveted seat. As I revealed in my post about the Anti-Fascism Rally, Lutfur spoke at the end of the Rally in Altab Ali park, standing shoulder to shoulder with Mr Galloway, about the need for new leadership in the Borough. Claiming that there was an “abuse of power” (as he sees it) by the current council leadership (Cllr Helal Abbas) in pressurising the Troxy to cancel the Islamic Conference. He mentioned nothing of the Hate preached by those invited to that conference to speak. The same preachers that had encouraged the EDL to want to stage a protest there. He went into a long worn out speech that culminated in him calling on the borough to vote for strong leadership in the upcoming Mayoral elections in October 2010. This is the same Lutfur Rahman who refused to deny his involvement with the alleged radical islamist organisation, the Islamic Forum of Europe (IFE) in Andrew Gilligans Dispatches Documentary. Read his letter to Galloway, he asked an organisation which stands accused by some of abusing human rights, if it was abusing human rights?…..can you really believe the gall of this weazely litter creature?, what the hell did he think they were going to say? He could have called for the disolution of the contracts on moral grounds, or pushed for them arguing the case under the Councils “Corporate Social Responsibility” charter, but no. In a borough whos history is littered with stories of people who risked everything, not least of which is the story of George Lansbury and the Poplar Rates Rebellion of 1921 he does nothing except ask some questions and then lays back in his gilded office, sure that he’s put the world to rights, not caring at all about Veolia’s ‘dirty little business’. Galloway the man who has fought so furiuosly for the rights of the Palestinian people, the man whos colleague Ken Ovenden, was literally kidnapped and thankfully released during the Gaza Aid Flotilla convoy, now stands by Lutfur Rahman, the man who had a chance to make a real stand in this country, make some lasting change to the lives of palestinian people, but decided he couldn’t be bothered, or that he was too scared to rock the boat, probably in case Veolia attempted to take out an injunction against him. This is the man Galloway now seems to want to support in his bid for leadership in the upcoming Mayoral elections. Lutfur Rahman, the man who has championed the over development of this borough, the man who developed a failed strategy in buying back ex-council homes, instead of investing in building them, the man who stood in power while this council gives away millions of pounds of tax-payer, council owned land, the man who engaged in the slow privatisation of one of the boroughs secondary schools (St Pauls Way), the man who has stood watch over Tesco trying to take over every corner shop in the borough, which has put a huge strain on local family run businesses, the man who stood watch, while the slow privatisation of our Housing service was kicked off, the man who didn’t raise his voice publically in the press regarding his indignation at his percieved “abuse of power” by the current council, its leader Cllr Helal Abbas, and the rest of the Labour Cronies, when it came to events at the Troxy. This is the type of man that Galloway should be campaigning against, he stands for everything that Galloway has himself has stood against, and yet this is the man, Galloway on 20th June 2010 in Altab Ali Park called for you to support as Mayor, the man who Galloway now feels will not undermine the people of this borough….